The Sofitel Palais Impérial hotel with its majestic Moorish facade and spectacular fountain welcomes you to a unique setting that combines the French art de vivre with the splendors of Marrakesh. 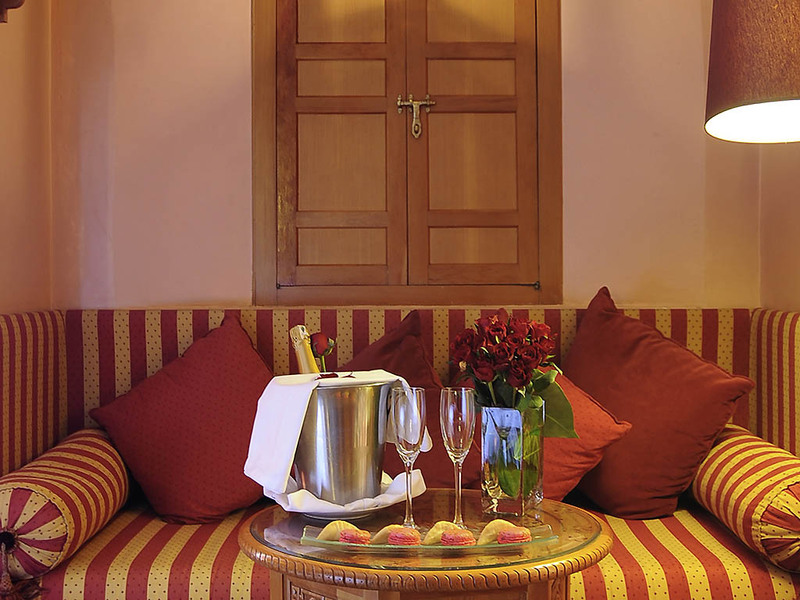 Our remarkable palace offers elegance in a privileged location in the heart of the city. On entering the lobby, the decor of a real Arab house will transport you into a different culture and gently immerse you in Moroccan tradition. 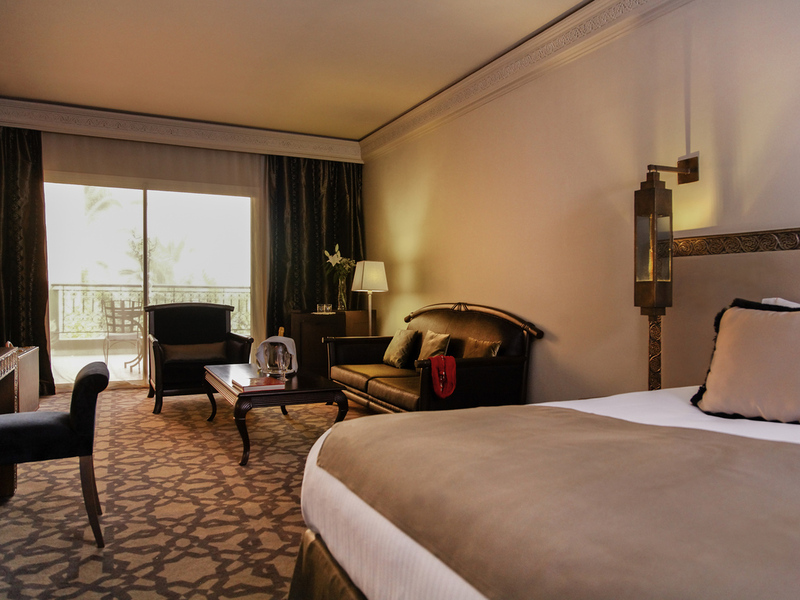 Enjoy our personalized service in a setting featuring delicate sculptures, fabrics in purple tones and ceiling moldings. Please join us for a Magnifique adventure on the red carpet of Morocco's vibrant Ville Rouge, where French art de recevoir accompanies you through Marrakech's UNESCO-listed medina with its narrow alleys, orange stalls, snake-charmers and story-tellers. Life is Magnifique in Marrakesh..
Come and discover the thousand and one faces of Marrakesh. In the shade of the palm trees or the narrow alleys of the Medina, between tradition and modernity, the mythical red city is a whirlwind of colors and scents, hustle and bustle. 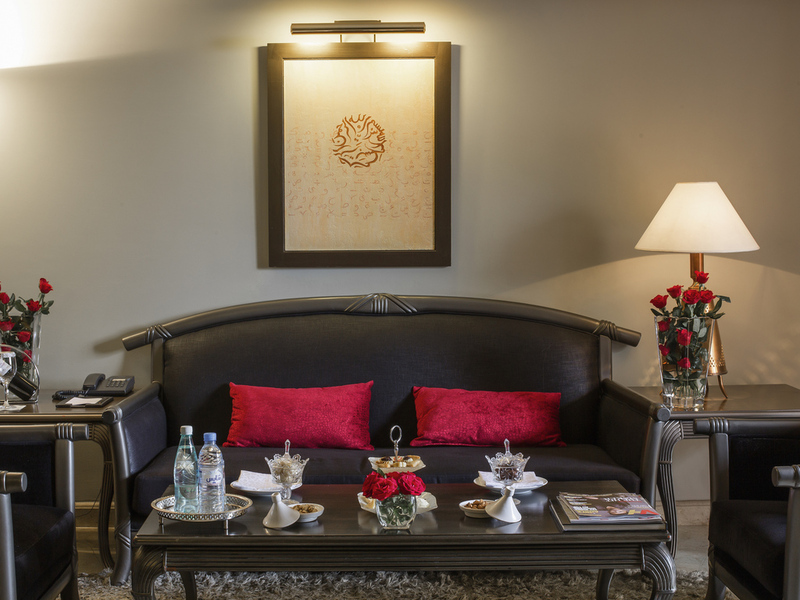 Set in the exclusive district of Hivernage, this Marrakech hotel convenient for the airport and an easy stroll from Jemaa el Fna square, restaurants, luxury stores and the historic attractions that make the "Ville Rouge" such an exciting destination. Sofitel Marrakech Lounge & Spa is a short drive from Marrakech Menara airport. Arrange a limo pick-up or take the Hivernage exit off the Casablanca highway. Trains from Fès and Casablanca arrive daily. Comfortably settle into your luxurious room or suite with views over the Atlas Mountains and pool, enjoy the Eastern refinement and Moorish luxury of your bathroom, and continue this exquisite dream curled up in the softness of the"MyBedTM" bed. 323 sq. ft. (30 m2) room with Moroccan decor, balcony overlooking the Atlas Mountains, marble bathroom with tub, Lanvin complimentary items, hairdryer, WIFI, satellite/cable TV, minibar, safe, Bose radio/CD player and air conditioning. 323 sq. 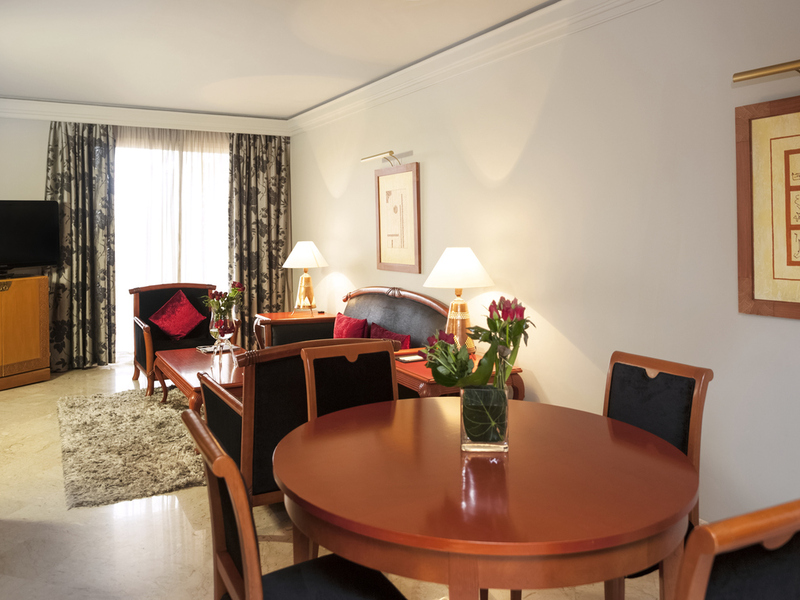 ft. (30 m2) room with stylish Moroccan decor, balcony overlooking the garden, marble bathroom with tub, Lanvin complimentary items, hairdryer, WIFI, satellite/cable TV, minibar, safe, Bose radio/CD player and air conditioning. 323 sq. 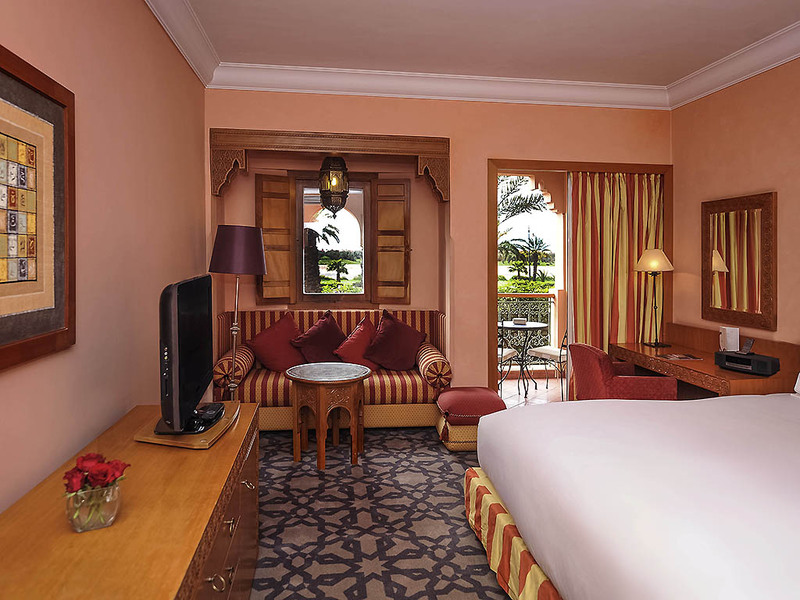 ft. (30 m2) room with Moroccan decor, balcony overlooking the gardens and pools, marble bathroom with tub, Lanvin complimentary items, hairdryer, WIFI, satellite/cable TV, minibar, safe, Bose radio/CD player and air conditioning. 474 sq. ft. (44 m2) suite with Moroccan decor, view of the Hivernage district. Lounge area, marble bathroom with tub, Lanvin complimentary items, hairdryer, satellite/cable TV, WIFI, minibar, safe, Bose radio/CD player, air conditioning. 474 sq. ft. (44 m2) suite with balcony overlooking the pool, gardens and Atlas Mountains. Lounge area, marble bathroom with tub, Lanvin complimentary items, hairdryer, satellite/cable TV, WIFI, minibar, safe, Bose radio/CD player, air conditioning. 732 sq. ft. (68 m2) suite with terrace overlooking the mountains, pool and gardens. Separate lounge, marble bathroom with tub, Hermes complimentary items, hairdryer, satellite/cable TV, WIFI, minibar, safe, Bose radio/CD player and air conditioning. Luxurious 872 sq. ft. (81 m2) suite with two bedrooms, terrace and separate lounge. Bathroom with whirlpool bath, hairdryer, satellite/cable TV, WIFI, minibar, safe, Bose radio/CD player and air conditioning. Ideal for family vacations. Welcome to our restaurants where Moroccan, French, Asian and international cuisine is masterminded by chef Ahmed Eddefaa. Treat your taste buds to the best of our local produce and discover new taste sensations. Enjoy the signature cocktails, created by our head barman to suit your tastes, in a cozy setting with enchanting decor. Savor pastries, tapas, aperitifs and glasses of champagne in stylish, inviting surroundings. Fragrant herbs and Moroccan spices infuse the buffet tables of Le Jardin, a relaxed breakfast spot or lunch restaurant in Marrakech. The whole family can indulge in dishes as diverse as tagine, rôtisserie or sushi. Amidst lush gardens and in an avant-garde atmosphere, the brilliant white So Lounge combines oriental flavors with contemporary French touches. The So Night Lounge will be reserved during the Marrakech International Film Festival. Savor authentic French cuisine by Dominique Oudin in our gourmet Marrakech restaurant: foie gras with berries, bouillabaisse... or try harira, tagine or a couscous dish by Ahmed Ed-Defaa. Culinary heights - matched by magnificent mountain views. Settle on the terrace of this cosmopolitan Marrakech bar and watch the sun drop over the edge of your glass... priceless. Fresh juices feature local fruits, while the drinks menu ranges from Veuve Cliquot to local Moroccan beers and bubbles. Taste afternoon tea with a delicious twist in this refined Marrakech bar. Tea rituals span the orient, with mint plucked fresh from the Jardin des Senteurs and almond cakes hot from the patisserie chef's oven. This Marrakech resort is dedicated to pleasure and the poolside bar makes it easy to relax. Cool off with a swim, then emerge to a refreshing cocktail or freshly squeezed fruit juice, immaculately served and perfectly chilled. Make the most of our Incentive Planners' expertise. Always ready to listen, they pay particular attention to every detail of your events, whether private or professional. 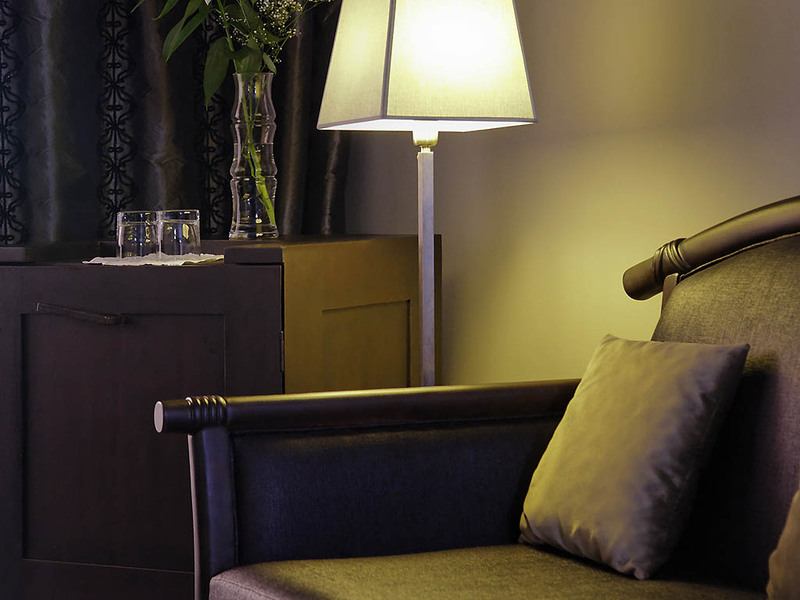 The Sofitel Lounges offer you all the comfort and high-tech equipment you could need. Whatever the event, our team will ensure it is an unforgettable success. For your gourmet experience sampling our local seasonal produce or aperitif cocktail, our chef is ready to meet your every wish. An exceptional visit and elegant service are guaranteed. An oasis of calm, expertise and serenity, So Spa is the ideal place to relax with its Cinq Mondes and Rituel Bleu treatments. Marisa Berenson has designed a range of products for a truly sensory experience. From your room or suite, our concierge will be happy to arrange your activities on foot, by car or on horseback and will listen to your suggestions for personalized activities inside or outside the Sofitel hotel. Our large Moorish palace and fragrant gardens are just moments away from the main tourist attractions of Marrakesh. Allow us to organize a guided tour of the Djemaa El Fna square and medina, or a magnificent tour through the Atlas mountains.